Grains mixed again this morning with corn down ¾ of a cents, wheat and beans up a penny. The United States and China will hold a top-level diplomatic and security dialogue that was supposed to be held in Beijing in October in Washington on Friday, amid moves to try to resolve a damaging trade war. 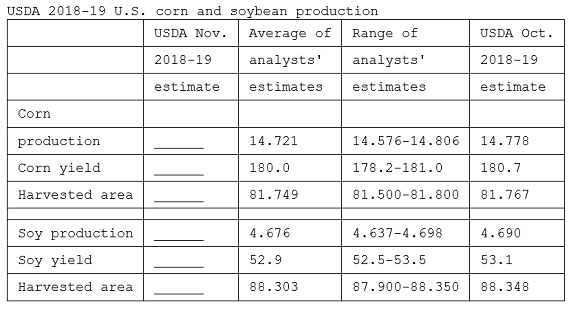 Yesterday’s weekly export inspections had U.S. wheat exports running 22% behind a year ago with the USDA currently forecasting a 14% increase, corn 78% ahead (up 2%), and soybeans 42% behind (a 3% decline forecasted). Yesterday’s crop conditions report pegged national corn harvest at 76% done with Kansas at 85% done. Beans 83% done with Kansas at 63% complete. U.S. Winter Wheat planted 84% vs 78% a week ago, 90% last year, and 90% average. U.S. Winter Wheat condition 51% good/excellent vs 53% a week ago, and 55% a year ago. Thursday, Nov 8th at 11 a.m. will be the next WASDE report. Expectations are slightly lower yield estimates on corn and beans. Ending stocks for wheat and beans are expected to see little change, but could see corn ending stocks make a friendly move.